Apple CEO Tim Cook continues to drop hints about the company's ambitions to enter the augmented reality space, most recently saying the technology is "for everyone," much like the now ubiquitous smartphone. 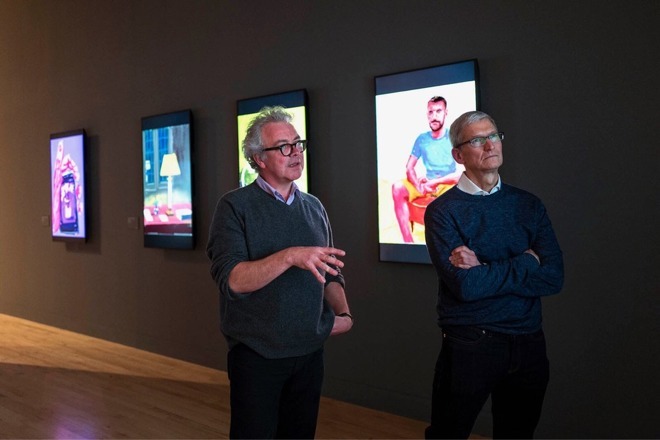 Tim Cook (right) visiting Tate Britain with curator Chris Stephens. The Independent caught up with Cook during a visit with UK-based app developer ustwo, makers of the hit iOS game Monument Valley. The Apple chief is on the third leg of an extended European tour that included stops in France, Germany and the UK. Aside from expectedly positive commentary regarding the health of Apple's developer community and vague allusions to an innovation-packed product pipeline, Cook briefly touched on the burgeoning field of augmented reality. While Apple has yet to release a consumer AR solution, the technology is quickly becoming the company's new "hobby." Reiterating his excitement over the prospects of AR, Cook said the tech holds more promise than its cousin virtual reality, which "closes the world out." Cook made similar comments in past interviews, suggesting Apple is looking to market an AR or mixed reality system in the future. Whereas VR puts users in a completely digitized 3D environment, AR is best described as a layer of digital information overlaid onto the physical world. Mixed reality takes the notion of AR a step further by allowing users to interact with both virtual assets and real physical objects at the same time. During an investors conference call last year, Cook said Apple is investing in AR as the tech holds great value for customers. Elaborating on the topic in today's interview, he called AR a "big idea" akin to the smartphone. "The smartphone is for everyone, we don't have to think the iPhone is about a certain demographic, or country or vertical market: it's for everyone. I think AR is that big, it's huge," Cook said. "I get excited because of the things that could be done that could improve a lot of lives. And be entertaining." Though some regard AR as a device or product, Cook views it as a core technology. "I view AR like I view the silicon here in my iPhone, it's not a product per se, it's a core technology. But there are things to discover before that technology is good enough for the mainstream," he said. "I do think there can be a lot of things that really help people out in daily life, real-life things, that's why I get so excited about it." Cook unsurprisingly stopped short of announcing exactly what Apple has in mind for AR, but his remarks make it clear that the field is of intense interest. Apple is quickly growing out its internal AR team through strategic hires and acquisitions including motion capture specialist Faceshift, machine learning and computer vision startup Perceptio, German AR firm Metaio and Flyby Media, among others. Those acquisitions go hand-in-hand with in-house development of transparent displays, iPhone-powered VR rigs, AR maps and other related technologies described in recent patent filings. Last month, Apple was reassigned IP from Metaio for an AR device with advanced point of interest labelling. Specifically, a pair of patents detail a mobile AR system — or smartphone — capable of detecting its surroundings and displaying generated virtual information to users in real time. Recent rumors claim Apple is working with optics manufacturer Carl Zeiss on a specialized AR headset that could debut this year. Less ambitious, and perhaps more believable, are rumblings that Apple will first integrate AR hardware and software into a future iPhone model before going all in with a standalone head mounted display.